Gangster Chhota Rajan, prime accused in the journalist J Dey murder case, thought that the veteran crime reporter was working for his rival Dawood Ibrahim and Pakistan's spi agency Inter-Services Intelligence, according to the chargesheet filed by the Central Bureau of Investigation. Dey was killed, allegedly upon Rajan's instructions, in suburban Powai on June 11, 2011. According to the CBI, Rajan told one Manoj on phone that journalist Jigna Vora (a co-accused) used to tell him "repeatedly" that Dey "is writing wrong things and is in touch with the other gang", and was a traitor. Transcripts of Rajan's telephonic conversations are part of the chargesheet filed by the CBI in a local court last week. Rajan further said that Dey was not a good person, and was working for Dawood and ISI. Jigna used to tell him that Dey was a "traitor", he said. Dey's wife told the CBI that for a month before his murder, he was very upset. "Once he told me that he was going to die but not due to illness," her statement reads. According to Dey's mother, around 15 days before his death he had told her that he would be visiting the Philippines. A few days before his death she also received a call from the accused Vinod Chembur (who later died) enquiring about Dey. Fifteen days prior to the murder Dey had signed agreement with actor Ajay Devgn for writing a film script, she said. The chargesheet also contains statements of journalists with whom Rajan spoke on phone after Dey's murder. Rajan told one of them that he regretted killing Dey. "A news reporter has to remain in his limits and work ...if you are writing lies..you are inviting serious trouble," Rajan said. According to another journalist, Rajan told him that Dey was hand-in-glove with "traitors", and he killed Dey. A close friend of Dey's told the investigators that Dey had told him that Rajan was calling him frequently. He found the gangster to be very "polite". "I told him...one should be alert...because dons are polite when they want to deceive someone," he told the CBI. On the day of the murder, Dey had told this witness on phone that Rajan had again spoken to him recently. As Dey was worried about getting frequent calls from Rajan, the witness suggested that he should see if he had made any mistakes (so as to offend the gangster). "Dey said so far he had done nothing wrong... but he had shared a very secret information with Vinod Chembur and from that day calls from Rajan increased," the witness said. According to a police constable, who is a witness in the case, Chembur's son Sanjay told him Dey wanted to get Rajan killed and was supplying information to Dawood gang. According to the CBI, Rajan was upset with Dey over certain articles written by him, and also because Dey's planned book described Rajan as 'chindi' (a small fry). The book, 'Chindi -- Rags to Riches', was to tell stories of 20 gangsters with humble origins. It was supposed to describe Dawood, Rajan's friend-turned-foe, as being superior to the gangster. Rajan was arrested at Bali airport in Indonesia on October 25 last year and deported to India. The 300-page chargesheet against him was filed at the special Maharashtra Control of Organised Crime Act court in Mumbai last week. The first chargesheet filed in the case in 2011 names Satiah Kaliya, Abhijeet Shinde, Arun Dake, Sachin Gaikwad, Anil Waghmode, Nilesh Shendge, Mangesh Agawane, Vinod Asrani, Paulson Joseph and Deepak Sisodia (all arrested). Another chargesheet was filed against Vora next year. Accused of instigating Rajan against Dey owing to her own professional rivalry, she is currently on bail. 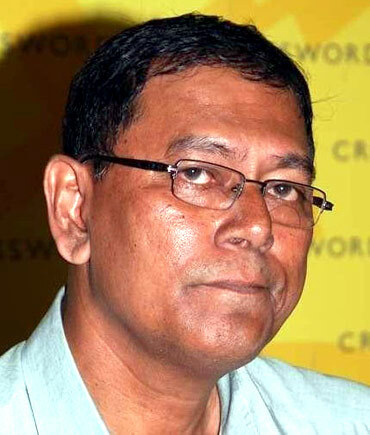 IMAGE: Did this man kill journalist J Dey?